I was reminded recently that it’s not just me that struggles to find time to write, we’re mostly all suffering from the same problem. Today’s world is busy, with so many things trying to compete for our time. It can be difficult to turn off notifications for Facebook, Instagram, Twitter, children (OK, maybe we can’t turn off the last one, although occasionally a mute button would be nice!) But if you want to write that book you’ve been talking about for years, the time is coming when you are just going to have to. 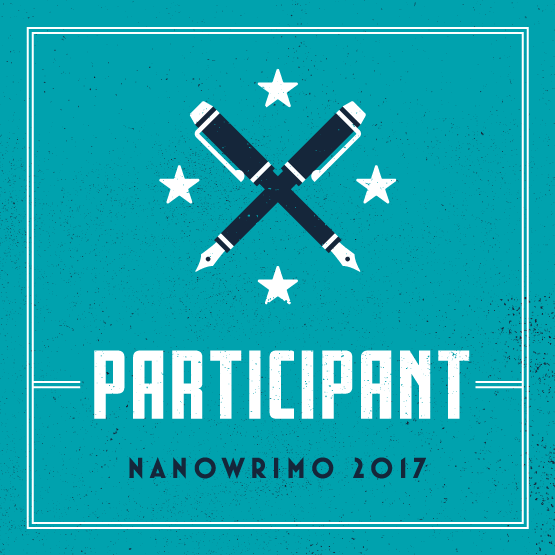 It is coming up to November – which means NaNoWriMo. If you haven’t heard about it, it is short for National November Writing Month, and it is a challenge to write the first draft of your novel, or 50,000 words in just 30 days. Sounds mad? Quite possibly – but the first draft of my novel ‘It Never Rains’ was written in a NaNoWriMo month, so I’m here to tell you it is definitely possible. It’s hard – you have to put writing first for the whole month, but it is only 30 days. If you think of it as a finite amount of time and you can relax when it gets to December, it isn’t so difficult to force yourself into hardship (because sometimes it is – trust me!) when there is an end in sight. Just imagine how good you’ll feel at the end of the month when you have a complete manuscript to work with. My rules are that there are no interruptions during my writing time unless there is a life-threatening situation (squabbles don’t count, but I have amended it to include dripping blood thanks to my daughter when she stapled her finger – the reason for letting that one in!). During the NaNoWriMo that I wrote my book, I used to try for two or three 15 minute sessions in the morning, then I would stay up later in the evening to write – trying to make up to an hour a day. And I just about got it done. I wasn’t going to go for NaNoWriMo this year, because I thought I was too pushed for time. But, in the replies I got to my recent survey, almost everyone was in the same boat. So this year – how about we all do it together? Conquer your fear. Take your nerves and just jump. It doesn’t matter if you sign up and don’t finish all the 50,000 words, no one will judge you – if you don’t want to tell anyone then no one will even know. There are only benefits. If you don’t finish – meh – at the very least you will have written more words than you would have if you hadn’t tried! But if you do, you’ll have the first draft of a novel – woohoo! Relax. The important thing to remember is it is just an exercise in writing – don’t go back and edit what you have written, just make sure to get the words down. It’s the old adage of, ‘you can’t edit a blank page.’ Once you have got the words down on paper, you can rearrange, edit, add chapters, take chapters away – whatever takes your fancy. But you can’t do that if there is nothing there. There are tips, strategies for writing fast, and (my favourite) sprints and games to help you write more – I had great success with the Harry Potter themed games to help me speed up last time. Squeeze in Time. Make sure to plan a little time here and there through your day to fit in these extra words. If you can manage a whole hour that’s great, but if not, try 6 x 10 minute slots, or 4 x 15 minutes, whatever suits your day best. The idea is to write 1,667 words each day. If that is doable, great, if not, it might be better to commit to 500 words a day, and then try to write more on the weekend. Again, it is all about planning and squeezing in the writing where it suits you best. And don’t forget, it’s only for a month, so try to work through the hardship and use the end result to get you through. Planning. Some people find it easier to prepare what they will write before NaNoWriMo starts. That way, at least you can get down to the business at hand, which is writing (in case you were wondering!). I am a planner, and if you need a helping hand, don’t forget I have a planning book that will help you get your ideas and outline down on paper, and expand it to be a plan of your whole book. It will help you write faster as well, as you will know exactly where you are going. Encouragement. The best way of continuing with something that is tricky, is to have encouragement. I know a lot of you are a little wary of telling people you are a writer, or that you are starting to write a novel. (I was as well to start with. It feels such a hard thing to say sometimes. Go on, try it – because you are a writer – even if you haven’t had anything published – you write, therefore you are a writer. If you are too nervous to tell people you know in real life that a) you are a writer and b) you are going to have a go at NaNoWriMo, then I’m here for you, and I hope there will be others that will join in too and we can all encourage each other. This will be one big encouragement party throughout November just to keep us focused! I’ll start – I’ve just logged in to NaNoWriMo and named my new novel (don’t get hung up on that step – you can change it later!) So, I ask you to do the same here, then come back here and let me know in the comments. We can do this together – I’ll try and add a new blog post every week (more often if I can) to see how we’re going. So, go on, let me know below if you’re going to give it a go. You always said you were going to write that novel so let’s go! Next Post: A Simple Challenge to Start NaNoWriMo With a Bang! Ok, I’m in. I am a bit nervous though. 50,000 seems a lot. Well done Steve. It is a bit of a cliche, but that first step is everything. And you’re right, 50,000 words is a lot, but hey, you’ve decided to go for it. That’s the important thing, so good luck. You can do it! Check back in if you need any encouragement – I’m here to help. I guess I will give it a try. I’ve wanted to write for the last 20 years and always afraid I couldn’t do it. I’m not going to tell anyone so I won’t hear any negativity. Kelley, that’s great! You’ve made the first step and it’s all easy from here (that’s a tiny lie as it is actually quite hard work to write 50,000 words) but the first step is all you need at the moment. So fantastic news, and you know you can do it, we’re all here to help. I totally understand not telling anyone, as I was the same with my first nanowrimo, but I made it, and so can you. I’m looking forward to seeing how you do. I think I’m going to try too. I’m not telling anyone either. Hope we can do it! Lizzie’s point #5 on planning is excellent. When I have a solid plan for what I want to write, it takes away my favourite excuse: “I don’t know what to write.” It’s one more tool in my toolbox to slay my innate writer’s procrastination. Lizzie’s point #6 is also great. Only tell those who you know will support your goal. November is all about supporting each other to do something we think is darned near impossible. It’s not. Anyone can accomplish 50,000 words in a month. Nanowrimo is my annual excuse to do nothing but write for 30 days. For me, the key is to make that decision, every morning, to write that day, no matter what. Then I follow that decision with action. I force myself to remember one fundamental truth – writing is easy. It really is. Getting started, on the other hand, that’s where I struggle. Once I’m strapped into my writing chair, fingers on the keyboard, it’s the easiest thing in the world. It’s the getting started… that’s the hard part, for me. Writing 50,000 words in 30 days is actually very easy (I wrote 55K in just 15 days in August), but not if I don’t make a conscious and deliberate decision to change my daily routine to make room for writing. When the choice is a hour in front of the television or an hour of writing – the choice is obvious. Nanowrimo requires me to change my mindset, my focus, so writing every day is the single most important task I complete every day in November. Now that’s inspiration! Thanks for that, and excellent tip about the tomato timer – definitely going to give that one a go. You’re right – it’s all about a change of mindset – so, two days and counting…Let’s do this thing! OK, I’m going to commit to this. It helps that there are other people out there doing this at the same time, like part of my syllabus requirement for a course. I always have trouble limiting what I am writing about, this time I’m writing it all as it comes, deleting the unnecessary later. I’ll keep repeating my mantra, “Perfection is Paralysis” and just let go. Okay, I just signed up. I “know” (meaning it’s very highly likely) that I won’t get 50K words, but I figured why not? I actually have a book I started some time ago that has almost 6,000 unedited words to it, but I won’t tell you how long it took me to write that 🙂 This way I’ll have two unfinished manuscripts sitting on my hard drive! Never say never Eric…this could be the push you were waiting for. Just try and write without worrying about how good or bad it is. As Susan said, ‘Perfection is Paralysis’ so get those words down as often as you can. It’s only 1,667 words a day (did I really write that!? ), and after all, two unfinished manuscripts are better than a blank page!